I heard that Josh Coates, CEO of Instructure, said this is the only book entrepreneurs need to read. You’re part of a startup. You’re an investor in startups. I wasn’t impressed the first time I saw this book. 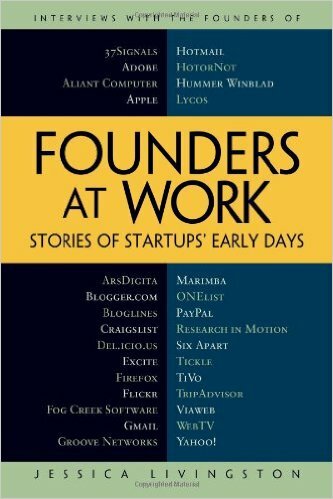 Sorry, but I judge books by their covers, and the cover for Founders at Work didn’t impress me. I also wasn’t impressed with the printing quality. The book looked like it was self published, and not very well. But it came highly recommended by a friend, and even if the cover design didn’t impress me, the list of names on it did. I also knew that the author, Jessica Livingston of Y Combinator, isn’t someone who would mess around producing a subpar book when it came to the content, so I looked past the cover and started reading. Once I started, I couldn’t stop. The book includes interviews with founders of companies and services we all use, or at least have used. Some of those companies aren’t around anymore, but the stories of how they started aren’t any less fascinating for it. Livingston did a great job asking the right questions, and in such a way that it’s not about her, but purely about the founders themselves. It’s like reading 30 biographies of famous entrepreneurs and finding out directly from their mouths how they did what they did. It’s about their successes as well as their failures. It works as a history of Silicon Valley. The interviews aren’t polished because they’re verbatim, which means they’re incredibly authentic. It’s this same authenticity that organizations like Startup Grind have tapped into for their events. This book is part of the “At Work” series and while Livingston’s book is my favorite in the series so far, other books like Venture Capitalists at Work and CTOs at Work are also great reads. It was reading these books and research for an upcoming book of my own that led me to contact the publisher Apress which resulted in me writing Chief Marketing Officer’s at Work, due out in March, 2016.